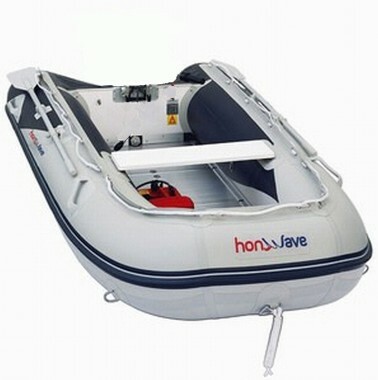 Portable and lightweight, our Honwave Inflatables are perfect as a tender for coastal exploration, fishing or simply gliding over the open water. With the addition of a Honda marine engine, the pair will make it easy riding all the way, because our innovative, large diameter inflatable tubes ensure top class flotation and stability, and the option of a V-shaped hull, means it will smooth out even the roughest of rides. Out on the water can be a harsh environment – after all it is ‘the great outdoors’. Honwave inflatables are built to endure whatever the wild can throw at them. That goes for every kind of weather and seawater – our inflatables are protected against them all. They are manufactured with high quality European PVC, quite simply the best available which makes them not only durable but also lightweight. As well as being crafted from European PVC, our inflatables also have a thick rubbing strake around the entire boat, which not only acts as a bumper to protect the tubes from puncture, but its curved shape deflects spray. Our aluminium-deck inflatables are an extra-rugged option which are suitable for just about any nautical need, their extra large buoyancy tubes mean even smoother cruising.